Here’s one you may have missed. While on the Hostile Takeover 2012 Tour, Krizz Kaliko linked up with two of the most respected names on the West Coast for a snapshot that bridged the gap between two generations. Joined by tourmates Tech N9ne and Machine Gun Kelly, Krizz Kaliko performed at the Higher Groundz Music Festival that also included live performances from E-40 and Warren G. Fans may recall that E-40 and Krizz Kaliko have already served up some heaters with “The Bidness” and “Doe Doe”. 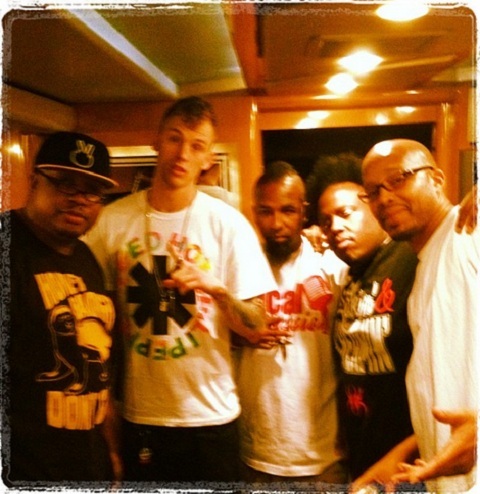 With Kickin’ & Screamin‘ already wrapped, is it time for Krizz Kaliko and Warren G to team up? Stay tuned for more from Krizz Kaliko! Would you like to see Krizz Kaliko work with Warren G?